If you’re a Social Media Manager, you’ll probably be expected to live and breathe social media. What used to be considered a bit of a cop-out job done on the side is finally being recognized as a profession that requires knowledge and skill. It also often requires the ability to react quickly to the comments, questions and, complaints of a global audience. Someone, somewhere, is always waiting for your response. Not to mention, you need to produce a lot of quality, relevant content fast, make sure it performs, and have the next posts lined up for at least the next few days should you, god forbid, get sick or be planning a vacation. With these expectations, it’s easy to feel the pressure. When social media fills 40 hours or more of your week, a full social media cleanse can be an appealing option. But is it really an option? With the expectation that your personal profiles reflect your professional knowledge and passion for your chosen career, it’s difficult not to feel a pressing guilt at neglecting your own Instagram,Facebook, and LinkedIn. Truth is, without the opportunity to take a step back from the social media world, you’re heading for a burn-out. The always-on mentality dominates pretty much every industry right now, but this is especially true with social media. Consistent use of social media can be detrimental to our mental health and so taking a step back now and again is essential, even if it doesn’t seem like an option because there’s just too much to do. To stop social media taking over your life, without losing a grasp on your job, here are some instant changes you can implement. Just turn them off. All of them. If you need to check something, you’ll have to go into the app when you can set aside the time to actually do something about them. This applies to both personal and professional profiles. Work notifications won’t be popping up on your phone at 8pm on a Sunday (nobody deserves that), and they won’t be building up on your home screen, lurking in the corner of your mind, causing a constant, and creeping sense of anxiety. Be deliberate in your actions when it comes to checking notifications and you’ll find you’re actually more productive and less stressed. You should also set aside an hour per day to mentally clock off and get back to basics. No screens, no scrolling, just relaxing. If you wait until your content is perfect, it’s going to be too late. Done and imperfect is better than not done. That’s not to say you should whack out a bunch of posts riddled with lazy mistakes (obviously), but you also shouldn’t spend hours designing and tweaking your content. If that is literally where half of your time goes, you need a designer! In the same vein, well-thought out copy is important, and by all means, A/B test your captions ‘til the cows come home. However, the exact wording of your social post does not require its own meeting (if it hasn’t happened to you, I can assure you it does happen). Attention to detail is a great quality, but perfectionism can be your enemy, so be wary of getting lost in those details. Whether it’s a demanding boss, a client who is never fully satisfied, or even yourself applying the pressure: know when to say no. If you have too much on your plate, recognize that and to let people know that you just don’t have the time right now. If you agree to do too much, you’ll spend every day feeling overwhelmed and nothing you deliver will be any good. Just because social media is “always-on”, that doesn’t mean you should be too. Anyone expecting you to spend 7 days a week managing social accounts, or to be “on call” when you’re on vacation, needs to hear the word no. It’s a matter of prioritizing and keeping your targets and the overall marketing goals in mind, so spend your time on what is going to help you get the results you need, and to hell with the rest. 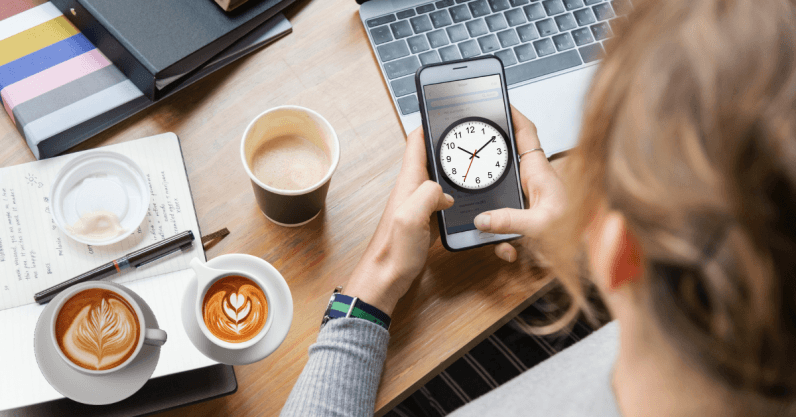 If you’re working across multiple channels or handling clients’ social media accounts, bulk scheduling content for automatic posting is a must. There are a number of scheduling tools you can use that allow you to bulk-schedule all of your upcoming posts at once for direct publishing to social platforms. Getting all your posts planned and scheduled in advance, even if you’re just a few days ahead, will allow you to focus on other things without small scheduling tasks interrupting your flow or requiring you to stay late at the office. Once your content is out there, you’ll need to report on performance either to your team, your boss, or your clients. Generating automated reports is possible with a number of social media management tools, so you don’t need to invest hours digging in to native analytics and creating your own graphs and presentations. You might need to personalize reports now and again, especially if you’re working with clients, but if you’re reporting weekly or even monthly, utilize automated reporting and save yourself a whole lot of time and stress. If customer support and community management are part of your social strategy, you could save time by integrating a chatbot such as ManyChat with your Facebook page. Set up a sequence that answers the most typical customer questions you get on social. This way, the majority of people you’d normally need to set aside time to reply to will already have found the answer to their question, and you’re free to tackle the million other tasks that need to be done instead. You probably don’t have the luxury of just picking one social channel to focus on at work. Despite the fact you know it’s better to be a pro at one or two, rather than covering all bases, you might have to keep a number of social media balls up in the air to keep your boss and your team happy. But that doesn’t mean you need to do the same for your personal profiles. Whichever platform you enjoy using the most – be it Instagram, Twitter, LinkedIn – choose that and use it build your own personal brand on social. Make one of your profiles the clincher when you’re looking for your next position and worry less about the rest. True, it’s always good to play around with new platforms to understand how they work – you never know what’s going to be the next big thing – but that doesn’t mean you need to market yourself across every platform. It makes sense to keep ‘testing’ profiles private or anonymous, and delete any that you just don’t have time to properly maintain, as they might not be a good representation of what you’re capable of. What if you know you need to detach yourself from your phone but you feel compelled to check it every 5 minutes, regardless of whether you’re getting notifications or not? Even if you feel like you need a social detox, it can be hard to break the habits you’ve built up. There’s actually a word for feeling anxious to be separated from your phone or going “off the grid”: nomophobia. And thanks to the gamification of platforms like Facebook and Instagram, where everyone is hunting for that dopamine hit a like or a comment triggers, social media addiction is also a very real issue. Ironically, there are apps that can help with that! Moment tracks your daily phone usage and allows you to set a limit on this, notifying you when you go over your limit. You can apply settings so that these notifications block your screen and remind you to put your phone down until tomorrow. In order to actually use your phone, you’ll have to close an alert every few seconds. It basically annoys you to the point of switching off. Other apps, such as Cold Turkey and App Detox also help you manage and limit your app usage, and if you need a real wake up call to shake you into putting down your phone, try the Mortality chrome extension. It’s basically a countdown of how many days you probably have left on this earth, though you can also use it to count down to deadlines or events other than your own demise. As the app description states, “it’s supposed to be motivational.”. Even Facebook recognizes the problem of social media addiction (that they helped create), and are now working on a feature to make sure people’s time on the platform is well spent. Feeling less stressed? You’re probably not (yet). But give these tips a go and see if you can claim back some of your time and lower your blood pressure. You don’t need to pack up your life and move to a secluded cave in the Austrian Alps to get some respite from technology. Switching off – even if it’s just for an hour rather than for a full social detox – is key to making you a better you (and a better Social Media Manager).